Manhattan Rickshaw Company’s team of pedicab drivers is a diverse group of people coming from a variety of backgrounds, uniting around the idea that driving a pedicab can be a fun combination of environmental activism, pollution free transportation, new urbanism, and flexible income. 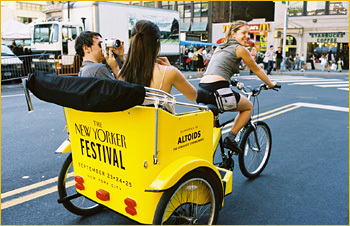 The main point to consider is that driving a pedicab is not a salaried or hourly paying job. Rather,you would be an independent contractor – meaning you would not be our employee. You would be your own boss and employee. In other words, you would be self-employed…aka, an independent contractor. There is no hourly wage. No paycheck. But, on the upside, you set your own schedule, wear what you wish, determine your route, and set your own fares (within reason please, and we can guide you on this). Whatever you make while you drive, you keep. There are other companies around the U.S. who collect a percentage of driver fare receipts from drivers, but this is thankfully not practiced in New York. So….not a typical job, but then you knew that already. It’s 100% more dynamic, and it puts you in charge. Yes, you can have slow days, sure. But in order to do well, you need to study the important destinations and monuments of New York City and learn the street pattern, which is mostly but not completely a big grid. Passengers will pick up on your comfort level and respond hopefully with tips!